It began with a forest of promises in 1992. At least that’s how Tom Maccagno, a lawyer with a passion for wild orchids, viewed Special Places. 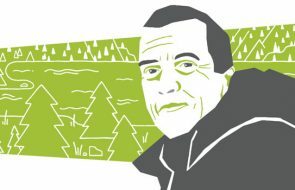 In fact Maccagno, then the mayor of Lac La Biche, hailed the “made in Alberta” program to set aside large areas of wilderness for protection, fun, heritage and tourism as a noble gesture. Nor was he alone. Opinion polls noted that Albertans, the nation’s most intense park users, uniformly favoured the creation of a network of protected areas as an urgent priority. “I felt really encouraged that the government might protect our natural treasures,” recalls Maccagno. The state of Lakeland Provincial Park and Recreation Area, the program’s original wilderness prototype, reveals the bleak future of Special Places—industrial development. In fact, this boreal park gives a whole new meaning to the word “special.” Although much of the damage was done before Lakeland was designated a Special Place, industrial development continues. Just last month, the Alberta government announced plans to run a major utility corridor for oil sands expansion through the eastern side of Lakeland. Seismic lines, roads and pipelines crisscross three-quarters of the Lakeland, making the forest look like shattered glass. 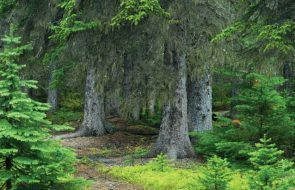 Clear-cut logging has removed half of the white spruce old growth forest, where 50 per cent of all the creatures live, and the government wants to remove more. The oil and gas industry holds leases on 40 per cent of the land. More than 25 well sites give Lakeland a unique industrial touch. According to government reports pike and walleye, once ubiquitous, are getting harder to catch, while trappers removed 1,059 fur-bearing creatures in 1997. Military aircraft routinely fly over the place during the summer while all-terrain vehicles cruise through Lakeland all year round. Lakeland is a microcosm of all the problems associated with protecting the environment in Alberta,” notes Richard Thomas, Lakeland’s former district planner and now an independent consultant. The ecologist recently documented Lakeland’s gross frag- mentation as well as the relentless destruction of other wild areas in the boreal for a 300-page government report. Most players, whether industrialists, naturalists or practical hybrids, freely admit that Special Places has lost credibility faster than the north is losing Woodland Caribou. The Canadian Parks and Wilderness Society (CPAWS) recently pulled out of the program altogether while the World Wildlife Fund (WWF) only sits at the table of the program’s “multi-stakeholder” Provincial Coordinating Committee to keep tabs on how the government is failing to honour its commitments. Most ranching communities have wisely refused to nominate any Special Places in the Grasslands largely due to their historic dislike of parks, bureaucracy and government. And both the oil patch and forestry companies now recognize that barring some unforeseen miracle the program won’t buy the political peace or stability that it originally promised. One of the purposes of Special Places, after all, was to end bitter wilderness feuds between environmentalists and oilmen by creating a positive international image for Alberta businesses that depend on natural resources. In other words, Special Places would spell out where the oil patch can and can’t drill. But that hasn’t happened. In fact, the inability of Special Places to protect any area, including the much disputed Whaleback (a remarkable patch of grizzly and elk habitat), has made industry all the more vulnerable to international boycotts and trade sanctions. So the program’s demise has not amused the oil patch or forestry companies. “I’m more concerned about the province’s ability to deliver on the vision of Special Places than I ever have been in the last three years since the process began,” says Rob McManus of the Canadian Association of Petroleum Producers. He believes, “It’s a major area of concern.” Peter Lee, Alberta’s WWF director and a former conservation biologist for the government for 18 years, speaks more bluntly. He says, “The seeds for destruction were sown when the government put forward a policy vastly different than its original commitment and different from all the public advice it had been given. And that has had a domino effect on the whole process.” Adds Wendy Francis of CPAWS, a notoriously unradical conservation group: “If this program runs its course we will have a network of com- promised areas and we will lose the wilderness in Alberta.” The program, of course, didn’t start as a wilderness burner. After Klein bragged about Lakeland and Special Places in 1992, he gave the program “high priority.” He then set up a Public Advisory Committee to review the noble idea of protecting endangered spaces and to solicit public comments. As a pragmatic province with a largely utilitarian view of landscape, Alberta was the last province in Canada to embrace the idea of setting up a wilderness savings account. Klein now wanted Alberta to show Canada how the job should be done. The advisory committee represented rational, middle class Alberta. Its six members included a cattleman, a forester, a tourism rep, two Tories, a former Banff Park warden and one business professor. There wasn’t one longhaired, polar-fleeced environmentalist in the bunch. Their recommendations pretty much reflected the public attitudes of the day—that wilderness was a wise investment. After dutifully recording loud public cheers for preservation (five per cent of the land base, after all, didn’t sound like a lot) the committee spelled out what mattered. For starters Special Places required urgent action and needed to be completed before the year 2000 before industry ate up the last best places. It also noted that only large areas (between 1000 to 2000 square kilometres) in each of the six natural regions could leave a lasting legacy. Small unconnected parks didn’t give large mammals such as grizzlies and caribou a fighting chance. The primary goal, of course, had to be conservation and to that end the province needed specific legislation to keep industrial hands off wild lands. Having local communities review potential sites so they could select ones with the least immediate economic impact also seemed like a fair idea. At the time nobody mentioned logging, drilling and Special Places in the same breath. But then things fell apart. “The two most influential government departments and kings of resource royalties, energy and forestry, went after the plan,” recalls Ray Rasmussen, who served on the advisory committee. “And they did everything they could to stop it.” Energy, for example, put out a bogus paper that said Special Places would cost the province nearly $1 billion in foregone revenue. (The 1996 Dobson/Thompson study by Alberta Environmental Protection showed the exact opposite to be true—that well-managed parks can contribute as much to the economy as farms or logging.) Like energy, which derives all its institutional power from liquidating resources, the forestry bureaucracy simply was appalled. Without public consultation it had just signed away a chunk of boreal forest almost five times greater than the land base Special Places sought to protect to Japanese multinationals. It hadn’t planned on saving trees for anything other than pulp mills. The civil servants of oil and fibre also suggested that hunting and fishing might be forbidden in Special Places, another half-truth. Then they charged that the program would doom grazing on Crown land. (In reality most naturalists have always supported grazing in grasslands as good buffalo practice). 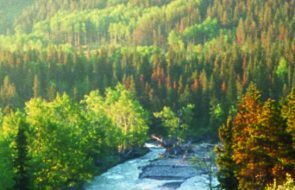 A 1995 cover story in Alberta Report billed Special Places as “green protectionism run amok.” Adds Rasmussen: “The disinformation got so bad that even chapters of Alberta’s Fish and Game Association started to oppose Special Places.” In the end the government’s anti- sterilization and pro-development forces won the day. As a result Klein’s government substantially rewrote policy for Special Places in 1995. The conservation focus disappeared as fast as a poached deer. So, too, did the idea of protecting whole watersheds and ecosystems so that they could continue their good economic work. The new game plan declared that Special Places would balance the goal of preservation with the parallel goals of outdoor recreation, heritage appreciation, tourism and economic development. The government called it “multiple use.” Conservationists tagged it “multiple abuse” and declared that they’d have nothing to do with it. The new policy not only broke Klein’s original promises but also defied prudent economics. Take the boreal forest, for example. It carpets half the province and provides Albertans with billions of dollars of free ecological services every year. These natural economies include oxygen-making, carbon-holding, fish-rearing, moose-making and water- cleaning as well as a lot of fibre-growing. Alberta’s boreal contains some of Canada’s greatest wetlands and it plays a major role in the world’s carbon cycle. If the tropical rain forest is one of the world’s lungs, the boreal is its able brother. You’d think that such a valuable, hard-working ecosystem might get a little respect. Not in Alberta. If Special Places runs its course we will have a network of compromised areas and will lose wilderness in Alberta. In fact almost every inch of the forest has been allocated to one or more industrial activities by the government. Already roads or oil wells have fragmented more than 75 per cent of the forest. Thanks to logging, drilling and farming less than nine per cent of the once great forest actually remains as wilderness. In some areas the clearing of the forest has proceeded at a rate faster than that in Amazonia. The government has so thoroughly liquidated natural capital in the forest that there is little left to preserve. The new version of Special Places also failed to recognize the value of wild lands as a sustainable base of tourist income, genetic diversity or just plain water filtration. In 1996 a government economic study leaked to the press showed that conservation paid and paid handsomely. It even detailed how intensively managed provincial parks and recreation areas actually generated higher levels of economic activity than agriculture or forestry. “Aside from protecting key parts of Alberta’s natural cultural heritage,” concluded the study, “programs like Special Places 2000 may, depending on the circumstances, lead to economic activity and employment that may be equal to or greater than conventional types of resource development.” Realizing that Special Places had wandered far from its original promise, the Tories eventually tried to woo some environ- mentalists back to the table. To do so the government finally protected backlogged wilderness sites in the mountains and foothills—Kakwa and Elbow Sheep. Environment Minister Ty Lund also said that preservation would still be the number one goal. “There was a great deal of doubt and angst but we decided to join the process,” says Wendy Francis, a CPAWS director. Other groups such as the Alberta Wilderness Association, an outfit largely founded by retired oilmen, never bought in. Nor did the Rocky Mountain Ecosystem Coalition. Big problems continued to dog the program. The new policy gave local communities a carte blanche veto over site selection and management plans without any guiding conservation principles because that smacked of “paternalism.” In other words, Lund and company again took a cue from Amazonia where Brazilian authorities advised hungry peasants to do what they wanted with the forest because the public interest was too difficult to defend. The government still hadn’t produced any legislation to protect special places from industrial advances. In fact, a National Heritage Act is now in the works that will permit industrial use. And the Tories faithfully vowed that they would honour all existing deals to log, drill, mine or develop every inch of Alberta regardless of the Special Place to be protected. Creative problem solving such as land swaps, debt for nature plans or royalty breaks were out of the question. “To talk in these tough times about buying back dispositions that were sold in good faith would be unfair and extremely expensive,” says Lund. Not surprisingly the government has added new dispositions to areas identified for protection. Take for example the case of the Chinchaga, a unique patch of old growth forest where grizzlies fish, caribou forage and Trumpeter swans nest in oxbow lakes. Both industry and citizens jointly recommended the place be spared anymore drilling or cutting. But three days after making their recommendation last year the forestry department allocated half the forest for logging. Bob Demulder, forestry director for Alberta Forest Products Association admits: “That came as a bit of a surprise. The forest industry had nothing to do with that.” Lund says the story’s a little more complicated. But his version illustrates the tortuous process now involved in any Special Places designation. To prevent “sterilization” now seems to be the central goal of Special Places. Rumsey, one of the world’s last examples of native aspen Parkland, was set aside in 1996 as a special treasure. The next year Alberta Energy opened the chest and sold a whack of new oil and gas leases in and outside this rare parkland. The energy boys don’t want us to worry. They say that only existing roads will be used. But a public committee that included the oilpatch had already agreed years ago that all gas and well development should be phased out. Ft. Assiniboine Wildlands Park got exactly the same treatment in northern Alberta. Lund and company have also fought hard to prevent the Crown Castle area from being “sterilized.” This mountain and foothills jewel was once part of Waterton Lakes National Park and boasts breathtaking hiking and mighty berry crops. But the folks that nominated the site, the Castle Crown Wilderness Coalition, weren’t allowed to be part of the local committee that decided the Castle’s special fate. Thanks to the doctrine of “multiple use” it will continue to include oil and gas exploration and log cutting. To ensure nothing got “sterilized” in the Whaleback, another piece of internationally prized wildlands in the Foot- hills, Amoco got a place at the table. Amoco holds leases in the area and not surprisingly recommended oil and gas activity in spite of a dramatic 1994 ruling by Alberta Energy and Utilities Board which said no to gas drilling and described the area as a “truly unique and valuable Alberta ecosystem.” Yet bad policy tends to have a domino of bad effects. Lund, however, remains an optimistic environmentalist. He says, “I think Special Places is moving along and slower than I would like to see, and yes we have a problem in the grasslands….Our objective is to make sure all regions have representative samples of their uniqueness and I think we will succeed.” But to many Albertans success in this venture now represents nothing less than a special betrayal of the public interest. Andrew Nikiforuk is a Calgary-based freelance journalist who writes about the environment, education and the abuse of publicly-owned resources. His books include School’s Out: The Catastrophe in Public Education and What We Can Do About It, The Fourth Horseman and Running on Empty: Alberta After the Boom. In recent years, his magazine articles have won three National Magazine Awards.